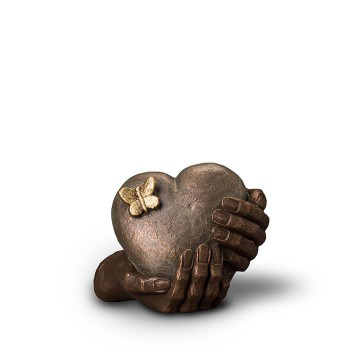 This ceramic bronze designer Urn has a distinctive sculptural quality and is suitable for a small amount of ashes. The exclusive details and elaborate symboloism means that it is not immediately identifiable as an Urn, but rather a piece of Art. All Geert Kunen designer urns are all hand made from bronze. Therefore every item may vary slightly in appearance. A green colour is added to the bronze mix again offering variations to each sample. All beautifully crafted. Mainland/non mainland UK – within 21-28 working days.